I do regret plunking so much down on this rather garish headshot. Hi there friends! 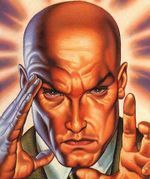 Professor Charles F. Xavier here, A.K.A. 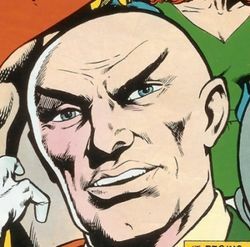 Professor X, Charles, Chuck, and, regrettably, that guy from those obnoxious Mr. Clean advertisements. I am here to talk to you about something that hits very close to home. Namely, myself. Now most of you know of me from that abhorrent Wolverine-Propaganda known as the X-Men Film Trilogy, where I was regrettably played by that dreadful Patrick Stewart. Needless to say, I am not a fan of these films, which differ greatly from my true life story. (True fans could catch my life story every Saturday morning on Fox during the 1990's.) Everyone knows I'm the leader of the eponymous X-Men, but I think it is time the world learns a little more about the wise, compassionate, manly leader of this rebellious group of chronic underachievers. 1 For instance, did you know that I am not paralyzed from the waist down? For instance, did you know that I am not paralyzed from the waist down? Contrary to popular belief, and this photograph, I am not paralyzed. This is a common misconception- mostly from the women in my life- that I was paralyzed, which is why I am wheelchair-bound. The truth is that, while I am able to move my legs, they are unable to support the weight of my body. This is because of a rare genetic disease that didn't present itself until the later years of my life. So, while I do need to use a wheelchair in order to keep a mobile, active lifestyle, I am not paralyzed. I really can't stress this enough. Being bound to a wheelchair is often seen as a negative. I, frankly, could not agree any less. Sure my legs are small and weak, but I make up for it in... other places. For instance, I stick to a strict weightlifting and fitness regimen. On even days I work biceps, triceps and pecs. On odd days, it's all about my abs. I'm no fool. I know I've gotten older, but that's no excuse to let myself go—In fact, I doubt I've ever been in better shape. And all of my working out has greatly improved my endurance while doing various strenuous activities. Obviously I can't run a marathon, but I've been known to be able to stay in a push-up position for hours at a time, should the need ever... *ahem* ... arise. And it does arise. All the time. My eyebrows, seen here, looking good. .....What were we talking about? Oh, right. My hair. Another little tidbit about ole' Charles is that my hair loss wasn't limited to only the top of my head. I no-longer grow hair on any part of body, save my eyebrows. Why only my eyebrows, you ask? Well have you ever seen a dude without eyebrows? It's not a good look, and I, as you know, keep my body looking good at all times. So, I might have psychic-ed up some eyebrows. I don't do that with the rest of my body because... I mean... WHY WOULD I WANT TO?! With the perfectly sculpted chest that I have, hairless is preferred. Just ask any pro wrestler. But, perhaps you disagree with me. Perhaps you think a little chest hair is a good thing. If you are ever lucky enough to be in the... position to see me shirtless, we'll see if I can't thrust you into a new position. Of the mind, of course. Yes, yes. Everyone seems to want to talk about them. It's never about me, is it? They used my surname to name the team, dammit! Why doesn't anyone want to talk about me, or my leadership skills?! Oh, sure they go out and do battle with all numbers of villains, but why won't anyone talk with me about my weight training, or general hairlessness? It's always "Wolverine, this! And Cyclops that!" I put them together! I'm the one who gave them the ability to even matter! ME! ME! ME! I get a little upset about my X-men sometimes. I mean to say that, I started this group as an environment that would give young mutants a safe place to talk about their powers, and experiment with themselves and others. I never expected them to gain such popularity and notoriety. But since they have... I just don't like being pushed to the wayside, that's all. There are a ton of great aspects about me; Such as, my workout regimen, the fact that I'm not paralyzed, and my severe lack of hair. All of these things are good, and none of them hamper me in any way whatsoever. I'm a good man. I have incredible psychic powers that I could use to control others into doing what I want, but I choose not to. I feel like this is another great aspect of mine. But I've brought that up in casual conversation while on dates before, and the women always get angry with me, and tell the police I have been threatening them. Which I haven't been. I am above such petty trivialities, above such threats, and above such women. That being said, I do have such powers. And I can control others into doing what I want. But I don't. 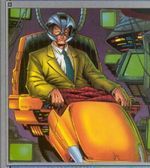 For those without comedic tastes, the self-proclaimed experts at Wikipedia have an article about Professor X.